Zucchini is a very versatile vegetable that tastes good in many different dishes like pasta, risotto, soups and works well as side dish too. That's why I use it often! This is a recipe that I learnt from my mom in Italy, and it's still one of our favorites! 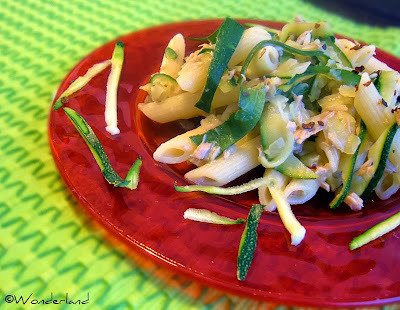 One good side of this dish is that it is very light and healthy: zucchini and tuna are both low in calories, zucchini contains 95% of water, helps the digestion process and gives many other benefits. So, in short, HURRAY FOR ZUCCHINI! In the original recipe you should use zucchini flowers, which taste wonderful deep fried. But around here I can't seem to find the flowers, so I always use the normal zucchini instead. Wash and slice the zucchini in thin rings or strips. Finely chop the onion and saute it in a saucepan with oil over medium heat. When it becomes soft add the zucchini and stir. Let it cook for about 5-10 minutes stirring from time to time, add salt, pepper and chili up to taste. Add then the tuna and mix well. If the sauce is too dry add some warm water. When the water boils, add the pasta and cook until al dente. Mix the pasta with the sauce and serve with parmesan cheese.